Why is turmeric yellow? One of the most recognizable things about our turmeric is it’s unique and dark yellow colour! It’s got a golden glow that really does steal the show. But here at Organic Turmeric, we don’t just want to tell you how awesome our turmeric’s colour is, we want to tell you why it’s awesome. The short story is, it’s high in curcumin, which is both a pigment and active medicinal constituent of turmeric. If you’re interested in the long story, read on below. Our turmeric starts life as a plant on small-hold farms in India. There, large-leafed turmeric plants are farmed in a traditional style – awaiting monsoon rains for nourishment before harvest. Once the turmeric has had a chance to soak up minerals from the soil and sunshine our farmers harvest the roots. Once it’s harvested, turmeric is cooked and powdered before coming to us for testing and packaging. The turmeric “root” that we think of is actually a rhizome, which means that it’s a storage point for goodness. Turmeric likes to store lots of antioxidant compounds, such as curcumin, in its rhizomes. 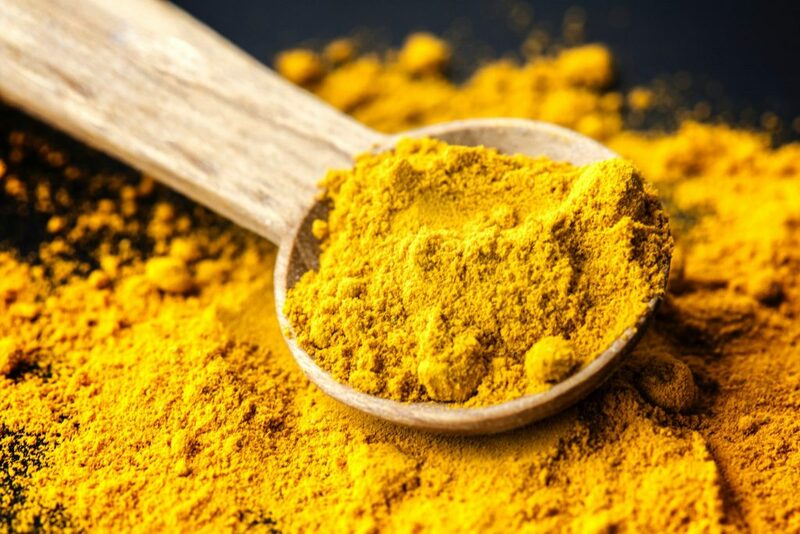 Curcumin is actually a pigment as well as an antioxidant – and on the whole the colour of turmeric tends to represent its efficacy. To get the highest amount of curcumin and therefore the best colour, it’s important to harvest turmeric at exactly the right time. Harvest it too early and the plants won’t have stored up much curcumin, harvest it too late and the plant will start using its stores up. The optimum harvesting time has a direct impact on the colour and quality of the turmeric that you buy! Another important part of the turmeric powdering process is cooking and drying the roots. Curcumin breaks down into curcuminoids and is better absorbed after it’s been cooked. If it’s cooked too long, however, some of the medicinal compounds in turmeric will start evaporating and many of the antioxidants will be used up. If turmeric has been cooked too long it can have a pale colour that lacks depth. Our producers get it right! They cook our turmeric for the perfect amount of time, giving us a rich golden colour. Our turmeric roots are authentically sun-dried as well, which is the traditional method. We can’t be sure, but we believe that this helps to contribute to the texture of our powder – fine and dry. Damp turmeric powder that is gritty is more susceptible to mould and bacterial growth. It’s also harder to encapsulate, something we learned early on. Farmers know what makes the best turmeric, and we listen to them. We’ve made mistakes in the past and learned through experience that we need to listen. Listen to our customers and our farmers. The colour of turmeric tells a story about where it was grown and who produced it. Our turmeric is fresh, vibrant and bursting with goodness. This is something that you can see for yourself every time you take a capsule or brew a turmeric latte. Thanks for taking the time to check out our site, and as always – if you have any questions please contact us!